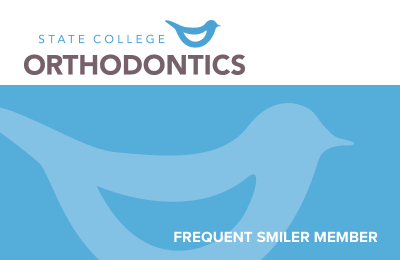 We have prepared this Braces User’s Guide as a resource to you throughout your orthodontic treatment. We hope that you find it helpful! Plan to eat softer meals for the next couple of days. Have the orthodontic wax packet near you at all times and use it! Take any over-the-counter pain relievers that you have used in the past for minor aches and pains. Acetaminophen (eg, Tylenol) or ibuprofen (eg, Advil or Motrin) can be very helpful in the first few days. Allow yourself extra time when brushing your teeth. It is going to take more time to brush around your new braces. Don’t forget to floss! Not only will flossing help your gums stay healthier, but also it will help you remove the unsightly food particles that can accumulate around and between your braces. If you have any questions or concerns, please don’t hesitate to contact us. We are here to support you every step of the way throughout your orthodontic treatment. Call us at (814) 308-9504. Avoiding certain foods and minimizing sugar intake during orthodontic treatment are necessary steps toward a fast, predictable and enjoyable orthodontic experience. Your braces may be damaged or loosened by eating hard or sticky foods. Loose brackets, bands and wires that need to be replaced will increase your time in braces. Why avoid foods high in sugar content and acid? Foods high in sugar content can cause bacteria in your mouth to start producing acids which can cause permanent stains and damage to your teeth. Acidic foods, such as sodas (even diet sodas! ), lemons and lemon juice can also cause permanent stains and damage your teeth. Once the irreversible white stains, known as decalcifications, are present, the only way of correcting them is for your dentist to replace them with fillings. “Braces” are made up of many different parts from bands or brackets that attach to teeth to the wires that move the them. Knowing the correct names facilitates communication between the patient and the orthodontic team. Also known as spacers, separators are small elastic or metal rings that are placed in between two teeth. Separators are used to create space between teeth in preparation of placing orthodontic bands. You should avoid eating anything sticky or chewy once the separators are placed in the mouth. Typically 1-2 weeks before braces or other appliances (such as expanders or space maintainers) are placed, these small rubber bands are placed between the teeth. They can make the area sore for a couple of days; over-the-counter analgesics such as ibuprofen or acetaminophen have proven helpful for some patients. What do I do if a separator falls out? Once enough space is made between two teeth, a separator or spacer will fall out of the mouth. In general, we encourage you to call us if the separator falls out within 2 to 3 days after it is placed. When you got your orthodontic appliance, you were shown how to take care of it. Here are some helpful videos to remind you of the best techniques for keeping your appliance(s) clean. On occasion, we will encourage you to visit your family dentist more than twice a year. A professional dental cleaning with your dental hygienist may be recommended three to four times a year. Using a soft-bristled toothbrush and a small amount of toothpaste, place the bristles where the gums and teeth meet. Use small, circular motions around the gum line spending approximately 10 seconds on each tooth. Brush the upper and lower dental arches slowly, spending time on EVERY TOOTH. For the lower teeth, brush UP from the gum line to the tooth; for the upper teeth, brush DOWN from the gum line to the tooth. Don’t forget to brush behind your teeth. Brushing your tongue will help get rid of the bacteria that cause bad breath. Special brushes, called proxabrushes, can be used between the braces. Try to brush your teeth after every meal. If you cannot brush right away, rinse well with water. Electronic toothbrushes and waterpiks can be helpful tools that reach the hard-to-reach areas. We recommend consulting with your family dentist and dental hygienist for the toothbrushes they recommend. Using a soft-bristled toothbrush, take care to place the toothbrush in the recommended position and brush as shown. Keep in mind that proper brushing with braces is necessary to keep the teeth and gums healthy both during and after orthodontic treatment. Using small toothbrushes that fit between the braces, remove the food particles and plaque that accumulate between the brackets on a daily braces. The proxabrushes are very useful in cleaning around the brackets. Using pre-threaded floss or dental floss on a floss threader, carfully pull the dental floss between the wire and braces. Carefully floss around the braces and gum area. Remove the floss, rethread, and place under the wire of the tooth next in line. In addition to brushing and flossing a special mouth rinse or toothpaste with a higher fluoride concentration may be recommended. It is recommended to floss between your braces daily. It is important to allow yourself adequate time, especially when flossing around your braces is new to you. Decalcification is the most common thing that can wrong with orthodontic treatment. Fortunately, it is TOTALLY PREVENTABLE. By avoiding foods high in sugar and acid as well as taking the time each day to properly brush and floss around orthodontic appliances, the risk of developing decalcifications can be eliminated. If something unexpected occurs during your orthodontic treatment, we encourage you to contact us immediately. While it may not necessitate a visit to the office, it is helpful for you to get appropriate information when handling an orthodontic emergency. Here are some of the most common things that can unexpectedly occur. What if a band or bracket becomes loose? If the cement seal that holds the band or bracket has broken, the band or bracket will move up and down or side to side. Call the office and schedule an appointment. If the band or bracket detaches from the wire, save it and bring it with you to your next appointment. The rings around the molar teeth are bands. If the band becomes loose, we encourage you to contact our office immediately. What if the archwire, headgear or ligature hook is loose, broken or lost? Unfortunately, if the wire breaks or a hook is lost, the teeth can shift in the wrong direction. Dry the area and place a small amount of orthodontic wax if it is irritating the mouth. Call the office and schedule an appointment as soon as possible. What if a wire is sticking or poking in the mouth? First, try tucking it with the eraser end of a pencil. Dry the area and place wax over the poking end to avoid further irritation to the mouth. Call the office and schedule an appointment. What if you have an irritation or ulcer in your mouth? Use any over the counter pain medication that has been helpful in the past. An over the counter topical medication such as Orabase or Ora-Gel can be helpful. Rinse with salt water. Some people are susceptible to mouth sores. The sores may or may not be caused by the braces. Call the office and schedule an appointment. What if a ligature or colored band comes off the bracket? You may be able to put it back in place or completely remove it with sterile tweezers. Call the office to let us know that a ligature has come loose or off. Depending upon the nearness of your next scheduled appointment, we may need to see you to replace it. What if you swallow a piece of your orthodontic appliance? Although this is rare, it does happen. Try to stay calm. Most often the swallowed appliance passes without any issue. However, on occasion, it can be aspirated. Coughing or trouble breathing are indications that it may have been aspirated. Call the office immediately. If there is a chance that it has been aspirated, you will be directed to get a chest film to confirm its position. It is helpful to have the following items on hand in case of an orthodontic emergency. Retainers are just as important as braces. When your braces are removed, you will be given retainers for your top and bottom teeth. In general, there are two types of retainers: fixed (cemented) and removable. It is important for you to know that you will need your retainers for life. Just like you commit to wearing eyeglasses when you are first diagnosed with a vision problem; you will depend upon your retainers to hold your teeth in their final position after your braces are removed. Without retainers, your teeth can and will shift thoroughout life. Good retainer wear is essential to keeping your teeth and bite in place. Without good cooperation, the teeth can shift and the bite will not function ideally.